Among the more annoying features of the Internet, the Meta Refresh is an anachronistic relic of the past that seems to persist only as a tool of black hat website owners. Fortunately, Internet Explorer gives you the option to disable meta refreshing as both a security measure and a means to reduce annoying automatic refreshing of web pages. What is a Meta Refresh? This particular example would redirect you to http://www.newpage.com after 5 seconds. Setting the CONTENT variable to zero would make the page automatically refresh without first loading the page. In the old days of the Internet, Meta Refreshes were used to cloak content, refresh advertisements that were programmed to randomly load, and artificially inflate hit counters to make a page appear more popular than it really was. Some of the legitimate reasons for using Meta Refreshes include redirecting visitors to the new location of a moved website, sending users to the home page after displaying a “thank you” page for a short time, and forcing the viewer to refresh the page to avoid displaying old content in the user’s cache. There are other consequences of Meta Refreshes that aren’t so benign. Some web content contains viruses and other security risks. Being redirected to a page with malicious content can be dangerous. Although not a major security risk, some web surfers prefer not to be victims of a Meta Refresh and opt to disable them in IE. 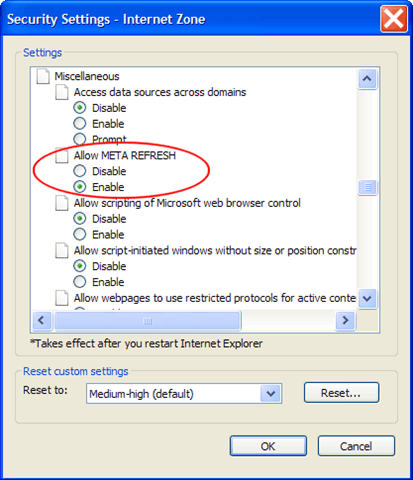 Disabling Meta Refreshes in IE is quite simple. 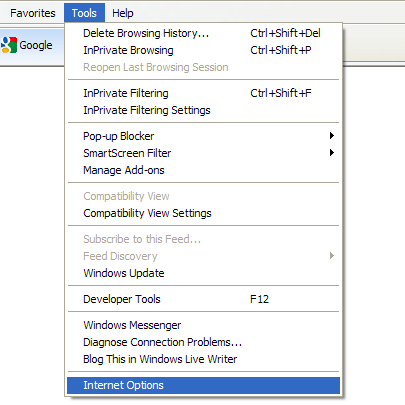 First, click on Tool>Internet Options to open up the Internet Options Window. Then click on the Security tab and locate the Custom level button. Click on the Custom level button to open up the Security Settings – Internet Zone window. In the Settings pane, scroll down to the Miscellaneous section and locate the Allow META REFRESH option. Under the Allow META REFRESH option, change the option from Enable to Disable. That’s it. You won’t be annoyed by Meta Refreshes in IE again. Keep in mind, however, that there are some legitimate reasons why a webpage programmer may use a Meta Refresh. If your browser isn’t displaying content correctly or a web page is acting funny, you may want to try enabling Meta Refreshing again to see if the problem clears up. iPod Shuffle Bricked, Not Charging?